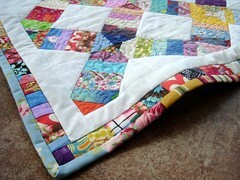 You know how sometimes when you photograph a quilt, or other item, it looks "off" even though it isn't in real life? Well, sometimes it really is the thing you're photographing. I've pressed, steamed, stretched, and squished and I can't get these waves to budge. It happened in three or four places. I'm not quite sure how they got there but they were there before adding the border and binding. Something to do with the way I sewed the triangles/string rows. Other than that I like the little quilt a lot. The only thing I'd change is to do the binding in white. I think the rest of the quilt, even though it's made from scraps, has a uniformity and crispness that should have been carried through to the binding, which was made from leftover scraps of binding from other quilts. Next time. I have a five year old niece, and I think she and her dollies will find a good home for this quilt. I've also finished the doll quilt for the swap. I'll show some pictures of it after I know the recipient has received it. Don't forget to enter the gift certificate contest! If you don't see anything for yourself you can either use it to purchase a gift, or pass the gift certificate along as a gift. Somehow I missed this post! I love the binding. It's one of my favorite parts of this uber cute one! I know this is an old subject for you and you probably forgot about this quilt. But since you make so many and you are so good at it. I wanted to give you my two cents on why this quilt didn't lay down like you wanted it to. 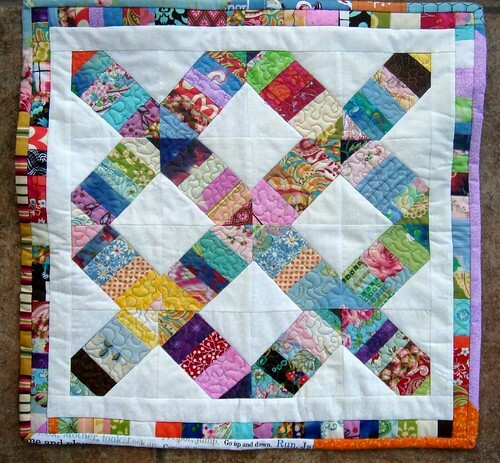 I believe it is because of the density of the quilting in the middle parts vs. the outer edges. The quilting is so much more dense in the middle that it pulls the fabric in and warps the outer edges. 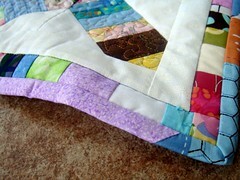 I really like all the beautiful quilts as well as the other sewing that you do. And I am blown away by the fact that you seem to manage 5 KIDS and still remain relatively sane.